Fig. 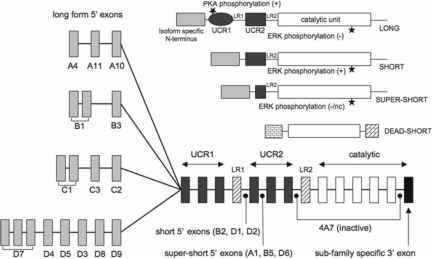 3 Coordination of TCR signaling by MAGUK-family proteins. Activation of PKC isoforms downstream of TCR leads to phosphorylation and activation of the MAGUK protein CARMA1. Phosphorylated CARMA1 will interact with Bcl-10/MALT1 complexes to form oligomerized scaffolds that in turn activate TRAF2/6. TRAF2 and TRAF6 will induce ubiquitinylation and assembly of proteins that lead to the phosphorylation of IKKP and activation of the IKK complex. This results in the phosphorylation and ubiquitinylation of IkB subunits and release of NF-kB. Results also suggest that signaling through CARMA1 can control the specific activation of JNK2. Binding of Dlgh1 to Zap-70 is supposed to induce an alternative pathway for activation of p38 and control of NFAT activity complex, leading to release of NF-kB and unmasking of the nuclear localization signal. NF-kB will then translocate to the nucleus and engage its cognate kB enhancer elements. Recent studies have described an important mechanism in connecting T-cell receptor signaling to NF-kB activation. In this model, IKK complex activation occurs through PKC8-mediated regulation of a supramolecular scaffold complex formed by the adaptor proteins CARMA1 (CARD-domain- and MAGUK-domain-containing protein 1), BCL10 (B-cell lymphoma 10) and MALT1 (mucosa-associated-lymphoid-tissue lymphoma translocation gene 1) (Rawlings et al. 2006; Schulze-Luehrmann and Ghosh 2006; Thome 2004). CARMA1 is a lymphocyte member of the membrane-associated guanylate kinase (MAGUK) protein family and contains N-terminal CARD domain, followed by a coiled-coil domain and a region containing PDZ, SH3 and GUK domains. Lymphocytes from CARMA1-deficient mice fail to proliferate after antigen receptor stimulation and cannot activate IKK or JNK (Egawa et al. 2003; Hara et al. 2003). Furthermore, a portion of CARMA1 seems to constitutively associate with lipid rafts where it is able to recruit and bind BCL-10, TAK1 [transforming growth factor-P (TGFP)-activated kinase 1] and IKKy upon receptor stimulation and initiate activation of the IKK complex (Gaide et al. 2002). Between the coiled-coil (CC) and the PDZ of CARMA1 is an important flexible linker region with several serine residues that are targets for phos-phorylation by atypical PKC isoforms (PKCP or PKC8) (Matsumoto et al. 2005; Sommer et al. 2005). This leads to an open active conformation, oligomerization of CARMA1 through its CC domain and binding of BCL-10 through CARD-CARD interactions, suggesting that CARMA1 acts upstream of BCL-10 in this process. Each BCL-10 molecule can then act as a binding site for MALT1 and under stimulating conditions form cytoplasmic structures called POLKADOTS, which are dynamic protein structures formed by multiple BCL-10 protein-protein interactions (Rossman et al. 2006; Schaefer et al. 2004). BCL-10 is part of the larger family of proteins that contain caspase recruitment domains (CARD) and has been described to interact with numerous proteins including CARMA1 and MALT 1. Chromosomal translocations resulting in BCL-10 overexpression lead to aggressive B-cell-derived MALT iymphomas characterized by constitutive NF-kB activation (Willis et al. 1999). In contrast, B or T cells from BCL-10 knockout mice are unable to activate NF-kB after antigen-receptor stimulation despite having intact calcium flux and relatively normal phosphotyrosine signals (Ruland et al. 2001). The specific CARDdomain interaction with CARMA1 seems to be functionally important since disruption of this interaction abrogates the ability of CARMA-1 to activate IKK and NF-kB (Gaide et al. 2002; Pomerantz et al. 2002). A downstream target of BCL-10 is MALT1, which is a protein characterized by an N-terminal death domain, two Ig-like domains and a caspase-like domain (Lucas et al. 2001; Uren et al. 2000). MALT1 knockout mice have defects in responses to TCR activation, including proliferation, IL-2 production and IKK activation (Ruefli-Brasse et al. 2003; Ruland et al. 2003). Like BCL-10, it is targeted by chromosomal translocation in some MALT lymphomas, leading to overexpression and constitutive NF-kB activation. Similarly, overexpression and oligomerization of MALT1 are sufficient to activate NF-kB, and combined overexpression of both MALT and BCL-10 has a synergistic effect on NF-kB activation (Lucas et al. 2001; Uren et al. 2000). In summary, data suggest that BCL-10 bound to CARMA1 acts as a scaffold in the assembly and oligomerization of MALT1, thereby creating a signalosome controlling NF-kB activation. The next step involves the positioning of TRAF 2 and 6 (tumor necrosis factor-receptor-associated factor) in complex with trimerized MALT1 and activation of their ubiquitin ligase activity (Baud et al. 1999; Park et al. 1999; Sun et al. 2004). TRAF2 and TRAF6 will induce ubiquitinylation and assembly of proteins that lead to the phosphorylation of IKKP and activation of the IKK complex. Finally, this results in the phosphorylation and ubiquitinylation of IkB subunits and release of NF-kB. The events downstream of MALT1 are conserved among different NF-KB-activating pathways and represent a convergence point in the NF-kB cascade. In conclusion, TCR activation of atypical PKCs leads to the recruitment and oligomerization of CARMA1, recruitment of BCL-10 and MALT1 and nucleation of an oligomeric protein complex that directs the activation of NF-kB. Interestingly, results suggest that CARMA1 has an additional role in generating specificity in the regulation of c-Jun N-terminal kinases (JNKs) downstream of TCR activation (Blonska et al. 2007). 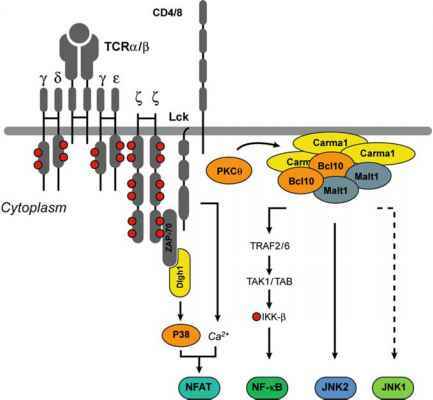 T cells express JNK1 and JNK2 isoforms, which both are activated after TCR stimulation, and CARMA1 deficiency seems to affect this activation. In fact, there appears to be a selective defect in JNK2 activation in a CARMA1-deficient cell line or T cells from CARMA1-deficient mice, suggesting that CARMA1 scaffolding through BCL-10 is able to specifically regulate the assembly of a JNK2-MKK7-TAK1 protein complex. Activation of JNK2 by this protein assembly seems to control the accumulation of c-Jun after TCR stimulation (Blonska et al. 2007). The significance of MAGUK proteins in the scaffolding and connection of signaling downstream of TCR has been further substantiated by the possible role of Dlgh1 in the direct activation of the MAPK p38 by Zap-70. Like CARMA1, Dlgh1 is an adaptor with several modular domains. It contains a proline-rich N-terminal followed by three PDZ domains, a SH3 domain and a GUK domain. T-cell stimulation leads to the recruitment of Dlgh1 to the immunological synapse where it forms a complex with Lck, Zap-70 and p38 MAPK (Hanada et al. 1997; Round et al. 2007; Xavier et al. 2004). This facilitates Zap-70-mediated phosphorylation of Tyr323 on p38 (Salvador et al. 2005), which induces a conformational change, dimerization and autophosphorylation on Thr180 and Tyr182. This alternative pathway seems to correlate with phosphorylation of NFAT at Ser 54 and increased transactivation. Overexpression of Dlgh1 in T-cell hybridoma cells resulted in a specific increase in NFAT reporter activity, while knockdown of Dlgh1 in T cells from TCR transgenic mice gave reduced p38 and NFAT activation (Round et al. 2005). It is important to note that Dlgh1 seems to skew TCR proximal events towards NFAT activation independent of the classical Ca2+-dependent activation of calcineurin, adding to the complexity in the regulation of this transcription factor. Together the recent studies of CARMA1 and Dlgh1 place MAGUK proteins at key positions in orchestrating signal specificity downstream of immune receptors and channeling toward distinct targets (Rebeaud et al. 2007). In this regard, it will be interesting to see if MAGUK proteins play a role in the unique transcriptional profile seen in CD4+/CD25+/Foxp3+ regulatory T cells and thereby can influence signaling underlying immune homeostasis.